SEOUL, South Korea, August 22, 2012 (ENS) – Electric car charging time could be cut from hours to just minutes by battery technology being developed in Ulsan, South Korea. 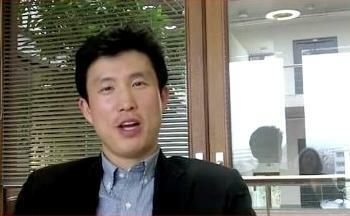 Led by Professor Jaephil Cho, researchers at the Ulsan National Institute of Science and Technology’s Interdisciplinary School of Green Energy developed the technology in collaboration with researchers from LG Chem, the largest Korean chemical company and a leading supplier of lithium-ion batteries. Professor Cho says the breakthrough technology allows lithium-ion batteries to recharge at least 30 times as fast as current lithium-ion batteries and up to 120 times faster. This means that drivers of electric cars could recharge about as fast as the drivers of gasoline-powered vehicles once the infrastructure to support this technology is perfected. Scientists have long known that lithium nanotube electrodes could increase the charging and discharging speed of batteries, but a first successful demonstration has now been done and is reported in the August 8 issue of “Angewandte Chemie International Edition,” a journal of the German Chemical Society published by Wiley-VCH. 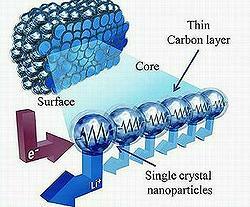 In conventional lithium-ion batteries the recharge process starts at the surface of the cathode and works inward. The electrochemical reaction takes place sequentially from the surface to the inside of the cathode. The revolutionary battery technology uses lithium manganese oxide soaked in a solution containing graphite as a cathode material. Sucrose-coasted nanoparticle clusters yield highly dense carbonized secondary particles. The internal sucrose graphitization enables the formation of conductive particles inside the network when heat treated at about 600 degrees Celsius. “This allows all of the powder inside the fine particles to simultaneously participate in the reaction, so very fast charging and discharging becomes possible,” the scientists explain. Professor Cho said that in this demonstration the scientists using this technology fully recharged an electric car battery in one minute. This research was supported by the Ministry of Education, Science and Technology of South Korea. Korean and foreign patent applications for this and related technologies have been filed. The global market for lithium battery cells reached US$10 billion in 2010; increases in the number of electric vehicles is expected to push the market to US$20 billion. The market for double electrode batteries is expected to reach US$8 billion as researchers continue to develop new technologies and stake claims to intellectual property rights.